Andrew E. Riddle had a sharp memory, humorous wit, and a lengthy past living in and around Mesa County as one of the area’s early settlers. He was a man of many hats: in the early 1900’s he experienced life as a soldier with the National Guard, a cattle and sheep rancher, and a successful Uranium mine owner of the Yellow Bird Mine in Paradox Valley, Colorado. As an interviewee for the Mesa County Oral History Project, Riddle explains his most vivid memories of living in the Great American West. In 1914, he was called out of college to work protecting the mines for the National Guard during the Colorado miner’s strike. This strike prompted the infamous Ludlow Massacre that same year, where at least 19 people (miners and their wives and children) were killed in their homes. Riddle expressed being ashamed of his involvement with the National Guard. His job was to protect the mines during the miner’s strike, but he sympathized deeply towards the deplorable working conditions of the miners. Herders and their flocks below the silhouettes of Yei Bi Chai and Totem Pole in Monument Valley. 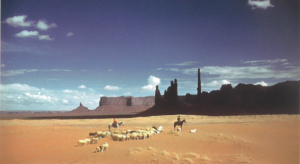 Image source: “The Four Corners: Timeless Lands of the Southwest” by Kathleen Bryant. Years after his National Guard stint, he moved to Grover, Colorado to live on his father’s ranch where he met his wife Eva, whom he called “irresistible.” It was there he assisted his father on the ranch and learned the business of herding cattle and lambs. Following the Great Depression years, he moved to Paradox Valley, Colorado, just south of Mesa County. Riddle proceeded to get back on his feet financially and purchased lambs to herd all the way from Goulding’s Trading Post in Monument Valley, Utah to his ranch in the Paradox Valley area. This was a 150 mile trip on foot. On several different occasions, he successfully navigated extensive travel while herding hundreds of lambs and sheep through the harsh Utah desert. His travels included intimate interactions with Native Americans while passing through the Navajo Nation reservation lands in Utah. Riddle recalled occasions bringing alcohol onto reservation land, not fully aware it was illegal by federal offense at the time. No wonder everyone so thoroughly enjoyed his visits! He also discussed going to a ceremonial Navajo Yeibichai festival in 1940. During this type of ceremony, the people dance to invoke Yei. Yei are a special category of gods who help the Navajo to live in harmony with the rest of the universe. Certainly cheaper than divorce court. If you’re interested in reading further about the compelling life of Andrew Riddle or other early Western Colorado settlers, take a trip to the past and check out the Mesa County Oral History Project. *Disclaimer: We recognize the term “squaw” as derogatory in modern day times, but for the sake of accuracy, the quote was restated in its entirety.